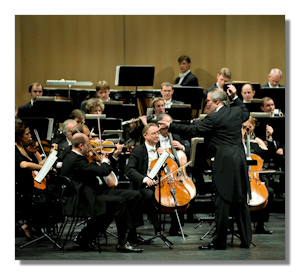 Valery Gergiev is not afraid of challenges. The tireless Russian maestro is currently offering with his Mariinsky Orchestra a cycle of all six numbered symphonies from Piotr Ilyitch Tchaikovsky (1840-1893). After appearances in California and New York, last October the program was brought to the Festspielhaus in Baden-Baden, with the First Piano Concerto, the Violin Concerto and the Variations on a Rococo Theme added for good measure. This solid Tchaikovsky orchestral anthology was completed in merely three days. To add to the overall attraction the concertos were performed by laureates of the most recent installment of the International Tchaikovsky Competition, since this year taken under the powerful wings of maestro Gergiev himself and clearly aimed to bring this once reputed but crumbling contest back up to speed. Valery Gergiev stated he wants to free Tchaikovsky of this often applied tag of garden-party music. There is no denying that in spite (or maybe just because) of his popularity, Tchaikovsky's oeuvre remains outside of a handful of evergreens generally little known by the main public, if not misinterpreted and, even worse, belittled by snobbish musicians. The first two symphonies are only occasionally heard in the concert hall, while the Third is for some obscure reason totally overlooked. Even if they represent the young composer, they help to understand how the remainder of his output, not only his later symphonies, but also his operas and ballets, eventually came to attain such heights and why by the end of his short life the man himself had become Russia's most famous musician with a reputation that reached as far as the United States. 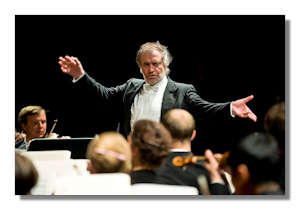 In any case, Gergiev successfully proved the detractors wrong. Hearing the six back to back (or rather in pairs per concert: 1 and 6; 2 and 4; 3 and 5) leaves little doubt they constitute a superb symphonic corpus, indeed, one of the finest in 19th-century Western music. Linking the symphony back to its theatrical roots, by a strong emphasis on melody and dance (Mozartean qualities that, incomprehensibly, are often considered flaws in this case), Tchaikovsky not only refreshed the genre, it also makes him quite a unique case in the 19th-century symphonic repertoire. That it practically developed out of nothing makes it all the more remarkable. When Tchaikovsky embarked on his 1st Symphony in 1866, the genre hardly existed in Russia. The first Conservatory had only been opened in 1862, with Tchaikovsky as one of its first graduates. Fast-forward some 30 years and we have the undisputed masterpieces of the Fifth and Sixth. A few more decades on and we have not only the often immense symphonic output of Russian composers like Glazunov, Prokofiev and Shostakovich, but also Tchaikovsky's influence as symphonist outstretching far beyond the Russian borders, with Sibelius and Mahler as prime examples. Gergiev duly turns the Tchaikovsky osmosis between symphonic form and theatrical lyricism into a vital asset. The passion and sincerity that characterize his readings make the naysayers sound like fools. He not only stresses the often brilliant coloration, the intensity and imagination with which he brings the manifold lyric themes, dance rhythms and dramatic images to life clearly follow out of Gergiev's experience as theatre conductor. His ear for the intricate polyphonic writing, the strong dynamic contrasts, massive granite-like climaxes balancing extra tender moments, the phrasing enlivened by extensive rubato, the edgy accelerandi, the telling pauses, all contribute to the exceptional force and seductive magnificence of this music. That we moreover can hear it performed by one of today's leading theatre ensembles, attuned to Tchaikovsky's and Russian music in general like very few other orchestras, makes the experience even more rewarding. The responsiveness of the Mariinsky was quite exemplary in this series of concerts, performing in spite of a grueling touring schedule without a trace of routine, its flexibility something to behold and the quality of the instrumental sections generally outstanding. Strings were antiphonally placed, but with the first violins facing the altos and the cellos in the middle. With the double basses behind the altos the right side of the orchestra provided a massive sound base. To see Valery Gergiev at work is in itself a remarkable experience. With his characteristic fluttering, hummingbird-like hands, sweeping arm movements and other body gestures, all the time blowing the cues, he strikes as a true sound magician. He didn't use a podium, clearly wanting to enhance a direct contact with the musicians. He also conducted Symphonies 4, 5 and 6 from memory, using a score for the early three and the concertos. All symphonies were performed virtually without breaks between the movements, marking the alertness and discipline of the orchestra. These were compelling readings and arguably may represent the most convincingly authentic Tchaikovsky one can hear these days. Curiously, the least successful symphony was the Fourth, where Gergiev's slow tempos nearly drained the life out of the first movement. The first three symphonies were on the other hand a constant delight and performed with a sense of purpose that placed them on the same level as the more famous ones. Already in the First Gergiev let us hear the gossamer textures with startling accuracy, while the movements were unfolding with great dramatic vitality. The symphony's structure was controlled with plenty of theatrical verve. Although the first movements are dynamically fluid, the real climax came in the final where following a truly gloomy intro with penetrating bassoons (a constant delight during this cycle) the orchestra got all its big guns into action, including trombones, cymbals and bass drum, to magnificent effect. The Second Symphony (1872/revised 1880) was by a carefully judged orchestral balance and a dizzying array of inflections in phrasing equally brimming with life. Energetic and exciting in the first movement, delicate and nostalgic in the second, playful but virile in the scherzo, the finale boisterously merry – the variety of moods that Gergiev secured from his orchestra seemed quite unlimited. The neglect of the Third Symphony (1875) (pointlessly nicknamed "the Polish" because of its polonaise in the final movement) is unwarranted. It is a ravishing composition, very melodious, full of color, and with the dance element now omnipresent Tchaikovsky had attained a different level of expression, but one that was there to stay. For balletgoers this symphony immediately evokes the theatre, not only because of its strong sonic connections with Tchaikovsky's ballets (Swan Lake was completed the following year), but even more because choreographer George Balanchine used four of its five movements for his ballet Jewels, now a staple in the Mariinsky Ballet's repertoire. Gergiev made no secrets about this link and after a characteristically energetic first movement, he developed the symphony with plenty of care and grace. The broad and lyrical central "Andante elegiaco" (in fact a waltz) blossomed into a moment of intense beauty, with Gergiev pushing the orchestra to an almost operatic eloquence. The opening movement of the Fourth Symphony (1878) was more problematic. Gergiev mentioned this symphony as his current favorite of the six and while it boasted several memorable moments thanks to the quality of the orchestra, overall it failed to convince. Gergiev tackled the exposition and development leisurely, allowing too many drops in tension. The fate-theme climaxes lacked impact and the two trumpets sounded slightly underpowered (something which also marred the 1st movement of the Third). The second movement, "Andantino in modo di canzona", was on the other hand a true gem. Gergiev's delicate phrasing and again these piquant woodwinds (the oboe player, probably Alexander Trushkov, needs to be mentioned, as does the 1st bassoon) made it sing out of all its force. The "piu mosso" section led to an operatic climax of immense power. The pizzicato scherzo was good fun before the predictably superfast finale with crashing chords and exciting percussion effects. Yet even here Gergiev slowed down rather intrusively before unleashing the coda at breakneck speed, testing the limits of the musicians. The Fifth (1888) and Sixth (1893) were given overwhelming readings. In the line of predecessors like Evgeny Svetlanov and Evgeny Mravinsky in Russia, or Ferenc Fricsay in Germany, Gergiev resolutely chooses for a forward-looking Tchaikovsky, a composer more visionary than most will give him the credit for. Tchaikovsky's mastery of the orchestra was now so complete he could mold the sound in any direction he wanted to. Lyricism was magnified by a sonic exploration of a different order in which the quest for beauty was no longer the only concern, involving passages of raw, ferocious impact – something that wouldn't be lost on Stravinsky, Shostakovich, Prokofiev and Mahler. There isn't any trace of hysteria or bombast – although, as many conductors have shown, it can be played this way – but here was a composer at the top of his game, continually experimenting with orchestral sonorities, rhythmical inflections and finding new manners of expression. That there was a recurrent presence of fear, sadness or perhaps even more an awareness of his mortality at this point in his music, is beyond question, but it didn't turn him into a neurotic whino. And Gergiev made sure he doesn't sound like one, balancing visceral excitement with aristocratic elegance. A case in point was the "Andante cantabile" in the Fifth Symphony. Although the connection with opera wasn't lost in Gergiev's rendition (the horn solo was given a tremendous performance), the movement's climaxes were moments of a different dimension, delivered with devastating intensity. The Waltz of the third movement was performed with plenty of grace (a necessary break after the drama of the preceding movement), but it wasn't long before bassoons and horns changed the climate. Tempos were overall more convincing in this symphony. In the exposition of the first movement of the Sixth, Gergiev coaxed playing of an eerie, beguiling tenderness, contrasting with the pitch dark carpet woven by the bassoons and lower strings at the beginning, or the sonic onslaught following the pppppp notation, when all hell breaks loose (and what magnificent trombones). The second movement was elegantly shaped while the scherzo had you on the edge of your seat. The final climax in the "Adagio lamentoso" was torn up by timpani that really seemed to pierce into another world; a world captured by these lugubrious trombones and a sound that transcended time and place. If only Tchaikovsky lived to write more symphonies after this. In between Symphonies 1 and 6, 20-year-old Daniil Trifonov performed Tchaikovsky's First Piano Concerto. Trifonov studied at the Moscow Gnessin Institute and the Cleveland Institute of Music with Sergei Babayan. There is little doubt this 2011 Tchaikovsky Competition gold medalist is a fantastic virtuoso, yet his interpretation of the concerto seemed rather slapdash. Impetuous but also unfocused, Trifonov alternated admirable ultra-tender passages aimlessly with run-for-your-life octave cascades. The ideas are there alright but he needs to find a way to channel them into something constructive. For now he left the impression he was merely using the concerto as a vehicle to demonstrate his technical prowess. Not that his articulation was that spotless. There were several slips in the melee and what he still lacks is a beautiful piano sound. Details remained occasionally blurred and his piano all too easily became clangorous. Much of the time he is bowed over his keyboard in an inelegant manner. The first movement cadenza began well enough but was eventually betrayed by Trifonov's own mannerisms. Conductor and soloist had a hard time finding a common wavelength but overall the best moments came when Trifonov was accompanying the orchestra. Of course, his barnstorming bravura and his puppy-like innocent looks readily make him the audience's darling, but judging by this performance he still has a long way to go. An affected rendition of Frédéric Chopin's Grande valse brilliante was offered as an encore. A more mature impression was left by the Armenian cellist Narek Hakhnazaryan who performed Tchaikovsky's Variations on a Rococo Theme during the second concert featuring Symphonies 2 and 4. 23-year-old Hakhnazaryan studied with Alexei Seleznyov in Moscow and Laurence Lesser in Boston. He has been a laureate of several international competitions before winning gold at this year's Tchaikovsky Competition. Boasting an immaculate technique and spotless intonation, he defined the work's different moods with flair. With no trace of artificiality, the adagio sostenuto resonated with congenial warmth, while the more virtuoso passages were kept in check by elegance and polish. 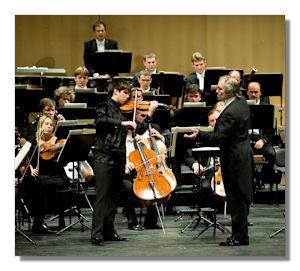 Violinist Sergey Dogadin is a pupil of V. Ovcharek and P. Popov in St. Petersburg. At 21 he is a prize-winner of several international competitions and took second place at the Tchaikovsky Competition last Summer (together with Itamar Zorman – the first prize was not awarded). There was nothing really wrong with his performance of Tchaikovsky's Violin Concerto. Technically and stylistically assured, he obediently blended with the orchestra, but his sonority remained all in all rather monotonous and for new insights or a genuine personality which might secure him a place among the select group of more-than-just-good violinists, it still seemed too early. It doesn't happen very often that one has the chance to experience a composer's symphonic legacy of this magnitude and value in such a short amount of time. This Tchaikovsky anthology offered by one of today's most fervent guides, constitutes a tremendous musical voyage and was revelatory in that it shows the significance of the man in a far more correct historical and emotional context. It is no mean achievement, and for that, gratitude to Valery Gergiev and the Mariinsky Orchestra, and of course to M. Tchaikovsky.